140 pages | 4 B/W Illus. Online video’s unique capacity to reach large audiences makes it a powerful tool to communicate science and technology to the general public. 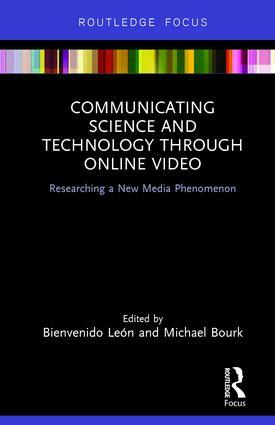 The outcome of the international research project "Videonline," this book provides a unique insight into the key elements of online science videos, such as narrative trends, production characteristics, and issues of scientific rigor. If offers various methodological approaches: a literature review, content analysis, and interviews and surveys of expert practitioners to provide information on how to maintain standards of rigour and technical quality in video production. 5.3. New Narratives for a New Age? 7. Audiovisual Formats and Content in University Corporate Communication: Lost Branding Opportunities? Bienvenido León is Associate Professor of Science Journalism and Television Production at the University of Navarra, Spain, and has published over 60 peer-reviewed articles and 21 books as author or editor, including El medio ambiente en el nuevo universo audiovisual (UOC Editorial) and Science on Television: The Narrative of Scientific Documentary (Pantaneto Press). Michael Bourk is Associate Professor of Mass Communication at the Gulf University for Science and Technology, Kuwait, and has published 17 peer-reviewed journal articles or contributions, several book chapters, and the book Universal Service? Telecommunications Policy in Australia and People with Disabilities (Tomw Communications).